Q: What sparked your own search for more, and ultimately, the idea behind More for Mom? For a long time, I lived my life from a place of depletion. I was physically and emotionally tired all the time, always feeling like someone was needing something from me, and ultimately just in a state of constant unrest, if you will. I think that’s what drove me to church. I didn’t grow up in church, but I would have called myself a “Christian” at that time, even though there wasn’t really any sort of relationship with God at that point. The longer I went to church, the more I learned about and believed God’s promise of an abundant life, found in John 10:10. When looking back, I can see that I lived my life for so long from a transactional standpoint—one that is very culturally based in our consumeristic world—a life of giving and receiving—back and forth between myself, others, even God. Life was always a give and take. However, this didn’t line up with John 10:10 in my mind, as it wasn’t giving and receiving from a place of abundance, but of depletion instead. I looked around and saw so many other women, moms especially, living this same way. When I first pitched it, this book originally was called Embrace the Crazy. 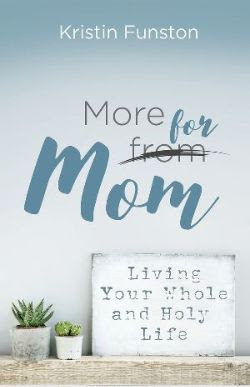 But upon diving deeper into the writing process, I realized “the crazy” of our mom lives is exactly how our lives are intended to be on this side of Heaven. The daily grind, screaming kids, and relentless demands of work aren’t supposed to be separated from one another or compartmentalized. All wrapped up together, they complete this life Christ has called us to. They are whole in Christ, and as believers, even holy, in the way we live it out. I feel like as a whole, we should embrace our crazy, but it’s only because Jesus has MORE in mind for us – to be whole and holy. This is the abundant life He promised. Q: What does it mean to be a whole and holy mom? A whole and holy mom is, number one, a believer in Christ and what He did for us on the cross. This idea of “wholeness” stems all the way back to the garden with Adam, Eve and the way humans were created. Just like when thinking of “whole foods,” that food is in natural state—the way nature intended for it to be, or pretty close to it. It’s the healthiest form of that food. Adam and Eve were physically, emotionally, spiritually healthy, complete and whole in the garden with each other and with God. Their lives were complete. This is how it was supposed to be, the way nature intended for us to be. When we claim Jesus Christ as our Lord and Savior, our relationship with our Creator is restored back to a place of wholeness, completing us emotionally and spiritually. Our “wholeness” is based on God’s ability to mend our brokenness and overlook our sin, because of what Jesus did on the cross. Because we are “whole” and complete in Christ, back in proper relationship with Him, we are, therefore, holy. Holy ultimately means to be set apart. So as believers in Christ’s sacrifice for us, we live a life that is set apart—different—than the way our culture and the world want or urge us to live. This life doesn’t have to (and can’t) be a perfect life, but it is one that’s different. When we follow Christ and live a life worthy of the calling He’s placed on us, God sees Jesus’ covering of us. He sees Jesus’ holiness in place of our sinfulness. So that’s it. A whole and holy mom is not a perfect mom, but a believer and follower of Christ right here on Earth, who admits she needs a savior. Q: You want to encourage women to stop believing the lie that more is needed from them and start living the truth that more is available for them. What is the more that they are missing out on? I think the details of the “more” they are missing out on is ultimately going to differ from one woman to the next, but it’s all going to stem back to Jesus. Because doesn’t everything? More life, more love, more joy, more peace, more of all that good stuff—it comes from Him. He is and has the more they are missing out on. Ephesians tells us that God is able to do more than we can even begin to think or ask. However, on this side of heaven, where we moms are asked to give and give and give, it’s hard to comprehend the abundance He has available for us. This giving that’s required of us in our roles as moms, wives, sisters and workers wears us down, distracting us from fully thriving and living in that place of abundance. Q: What are some of the other lies moms need to let go of in regards to being whole? 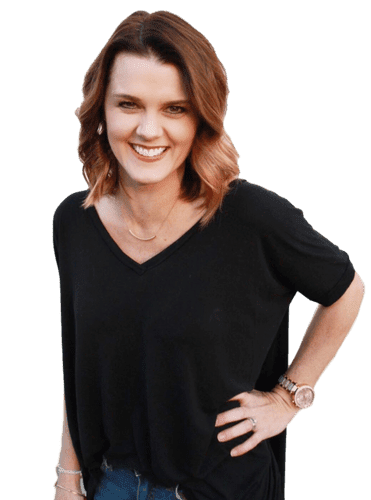 First, that our lives are somehow segmented into different areas such as the “mom life,” “social life,” or “work life.” No, our lives aren’t meant to be compartmentalized, but instead work and blend together to create one whole and complete life. Just like ingredients in a loaf of bread, each segment of our life isn’t good on its own, but together make one whole tasty and nourishing loaf. It’s important to note that onewhole loaf of bread can feed an entire family. And if Jesus is involved, like in Mark 6, it can feed thousands. Underneath this umbrella of wholeness also lay lies about our identity. Such as ones that say our worth is based on our work, or we must always be doing or giving to and for others, or even that motherhood is the highest calling from God. I cover many of these in the book, More for Mom, but they all come back to the skewed perspective of how we view our identity and how we were created to be whole and complete in Christ. Q: What do you mean when you write that our lives are full, but they aren’t whole? We live in this crazy, busy, modern world. A world that fills our schedules, minds, and desires. We can literally fill our lives with things, people, events, books, jobs, thoughts, feelings and so much more, but we can still be incomplete. This stuff filling our lives doesn’t always complete us. I believe it’s God, number one, that completes us, making us whole, and then His kindness allows us to seal it with the extra blessing of relationships. Q: You write that we need our brains to create a muscle memory of what whole and holy thoughts feel like. How do we do that? Having mental muscle memory means we can self-correct when our thoughts, perspectives and mindsets are not at a place where they should be based on our outside circumstances. First, we must learn to feel and know when we are wrong, so we can autocorrect and get our mindsets to a correct place of thinking—the place that is whole and holy. This isn’t a fast process, but there are a few things we can do to begin this training process. First, we must learn to identify triggers that set us off. These triggers can be recognized easily when we notice them with what the Bible calls “works of the flesh” from Galatians 5:19-21. Whatever happened right before these works of the flesh showed up, that’s the trigger. Second, once we identify triggers, we redirect our thoughts by meditating on what is good. We line up the thoughts, feelings and words we have next to scripture. A good place to do this is Galatians 5:22-23, in what are called the fruit of the spirit: love, joy, peace, patience, kindness, goodness, faithfulness, gentleness and self-control. When we look for this fruit in any given situation, we are automatically meditating on what is good, focusing our thoughts on godly things and training our minds to think this way, despite outside circumstances. Q: What do you hope readers gain from reading this book? As I’ve mention, for the longest time I felt depleted and exhausted from my life. (If I’m honest, I have to admit that I still feel that way sometimes.) I know I’m not the only one who has ever felt that way or will feel that way in the future. I’m ready for us to give from a place where we can do more than just give; we can give in a celebratory way because we’ve already received more than would ever be enough. This perspective will shape what our daily grind looks and feels like because we’ll finally recognize what it means to be whole and holy in the day-to-day. That’s very churchy language. Basically, I want moms—really everyone—to have peace in their daily grind because of all we have available through Christ.